The undersea fiber cables that were cut a couple of months ago were the subject of numerous conspiracy theories, but satellite photos have revealed the culprits--cargo ships that were anchored in the wrong place. Sometimes Occam's Razor (the simplest explanation is the likeliest one) is exactly right. The object lesson for communities is to plan for cable outages by making sure local networks have redundant cable paths. Sometimes this is quite expensive to do when just getting started with community telecom investments, so an alternative to a second fiber cable is a high capacity wireless link that can handle local traffic (perhaps with somewhat less throughput) while repairs are made. Is WiMax the silver bullet? An Australian wireless ISP who has operated a WiMax network for more than a year unleashed a blistering attack on the protocol, calling it a "disaster" and that it "failed miserably." Unfortunately, the article provides little detail on exactly what frequencies were used (WiMax is a catch all term for the protocol, which can use several different chunks of frequency spectrum). The interesting thing about the comments is that the firm is planning to deploy more traditional WiFi as part of their wireless network. This article illustrates that wireless systems are not a panacea, and that they have to designed and engineered carefully to get good performance. According to a New York Times article, Europe is pulling far ahead of the United States in high performance broadband deployment. European countries, led by Sweden, Denmark, Holland, and Finland, are adding 50,000 broadband lines a day. In Europe, most countries have required the incumbent telecom firms to allow other broadband firms to lease their infrastructure, which has led to heavy competition and lower prices. While many of the new connections are still copper-based DSL, many places have gone to citywide fiber deployments. In Paris and Vienna, 100 megabit fiber connections are widely available. If you live in Paris and have the new 100 megabit fiber to the home service, it only takes about ten minutes to download a high quality version of a one hour TV show. Here in the U.S., the FCC has announced that more than 95% of the U.S. has broadband. The FCC defines "broadband" as "anything faster than 256 kilobits, or about 400 times slower than the current Parisian definition of broadband. Two fiber cables on the floor of the Mediterranean were cut, causing huge disruptions in Internet service to the Mideast and Asia. A fisherman's anchor apparently snapped the two cables, which were the primary and backup links to a major Internet exchange point in Egypt. The problem highlights an increasingly important economic development issue in the U.S. More and more businesses, as they consider where to relocate business operations, are asking not only if there are two or more fiber cables serving a community. They also want to see diverse routes, or two completely different paths. Unfortunately, in a lot of places, there may be two cables, but they may both share the same right of way, meaning an errant backhoe would cut both of them with one swipe. If your region wants to attract new businesses, you should be planning to address the need for redundant cables and diverse routes for those cables. It will give your region a key marketing edge if a) you already have that essential telecom infrastructure in place, or b) you can talk knowledgeably about the need and show a specific plan for achieving redundancy and diverse routes. "The 'pitch' in Nuenen is not about 'bandwidth' 'fibre' or anything techie. Nuenen has an elderly community, consequently Ons Net aimed to appeal to a 75 year old woman who does not own a computer nor used the internet," he explained. It is local services supporting security, home care, events on the local TV channel and improving the community that are attracting people. In order to secure the necessary funds Ons Net was looking for an initial 35% sign-up rate. In fact it got closer to 85% and posted a £1m profit in its first year. In Nuenen, residents get connected to a 100 megabit capacity fiber network, and buy individual services like Internet access, telephone service, and TV service. This is a fundamentally different business model that creates real competition among service providers and tends to lower service costs. Communities in the U.S. pursuing this approach include Palo Alto, California; Seattle, Washington; Gainesville, Florida; the 15 community MegaPOP project in Mississippi; Danville, Virginia; and The Wired Road project in southwestern Virginia. The last two communities are being assisted by Design Nine. Japan continues to rocket past the U.S. when it comes to fiber deployment. Japanese businesses and residents can get fiber broadband connections in more than a third of the country, compared to less than 2% of the U.S. Japanese broadband customers also pay much less; a 50 megabit fiber connection in Japan sells for under $30 a month. The fiber connections are enabling all kinds of new services, including telemedicine and telehealth applications. Japan is already well beyond the tired "triple play" that still gets most of the attention in the U.S. (voice, video, and data). An open, multi-service network can provide communities with access to innovative new services far beyond the old monopoly-style services we have today. Internet access providers in the UK are being challenged on their broadband speeds, which their customers claim are not as advertised. An independent study showed that 62% of customers were getting less than half the advertised bandwidth that their provider had promised. The article has an unintentionally humorous quote from a member of the commission studying the problem, who said, "...there were good technical reasons for the gulf between advertised and actual speeds." Yes, like the service providers have not bothered to provision their equipment to actually deliver the advertised bandwidth. Network architecture is important, and communities looking at making investments have to make sure they pick the right network architecture. A properly designed Layer 3 multi-service, open access network can easily deliver advertised bandwidth to customers, and some communities in America are already moving to this architecture, and away from the older systems that have been used for the last fifteen years. Design Nine designs ONLY multi-service networks that can deliver advertised speeds, because if communities are going to make these investments, businesses and residents need to know they are going to get their money's worth, rather than empty promises from equipment vendors selling systems that can't deliver. This article talks about Japan's investment in broadband networks, including a nationwide fiber deployment with speeds of 100 megabits. The country has a built in advantage because of its small size; short distances between telephone switches and homes means DSL can run faster over existing copper cables--at speeds higher than is possible in most parts of the U.S. But the country regards copper as obsolete and sees DSL as a stopgap measure until fiber connections are ubiquitous. As the 100 megabit connections become more common, new applications no one ever thought of are being rolled out. One example cited is using the high speed fiber to examine tissue samples remotely. Patients not near pathologists can now get a better diagnosis because the network can transmit very high quality images quickly, enabling doctors at remote facilities to make more accurate examinations. Galactic Suites, the space tourism venture, has a Web site with additional information about the space hotel it is building. Space-related businesses are already transforming the New Mexico economy, and states like Virginia and Texas are also beginning to reap benefits. Not every region will find a niche with space-related opportunities, but the success of New Mexico illustrates that boldness and determination pay when it comes to economic development. Does your state have the slowest broadband? It is every economic developer's nightmare. On the front page of today's USA Today (no link online), there is a list of the five states with the slowest broadband in the country. Who wants to be on that list? In Australia, slow broadband has been recognized as a major economic development issue. Officials there have said that slow broadband hinders the ability of commercial, manufacturing, and agricultural businesses to be fully integrated into international supply chains. In other words, if your businesses don't have the right kind of affordable broadband services available to them, they are going to lose business. A Mach 10 (ten times the speed of sound) test of a scramjet took place in Australia, where a rocket carried the scramjet into near space, then ignited the scramjet to return to earth. Scramjets are special jet engines that work at very high speeds and at high altitudes, and research has continued on them for decades with mixed success. A successful and reliable scramjet design would allow travel between London and Sydney, Australia in as little as two hours. According to the latest international study on broadband use, the United States has fallen from 16th to 24th in number of households with broadband (53%). South Korea is the world leader, with more than 90% of homes connected. Japan, Germany, France, and the U.K are all well ahead of the U.S., so we cannot just dismiss South Korea's lead as simply a factor of household density. Unfortunately, the U.S. also has the most expensive broadband at the lowest speeds. While it is true that the size of the U.S. makes broadband deployment a bigger challenge than in many other countries, the real problem is outdated business models for telecom services. The incumbent providers have stubbornly resisted reforming or changing their business models for telecom, which has led to very slow deployment, and a rather circular red herring argument about broadband. The argument goes something like this: "There is no money in broadband. So we cannot afford to invest in high performance fiber and wireless systems." The circular part is "we would invest if there was money in broadband, but there is not any so we can't." The red herring part is blaming "broadband" when in fact that has nothing to do with the problem. A correct statement of the problem would be, "Our current business model stinks, so we have no money to invest in better networks." That would be honest, and would lead naturally to a sensible discussion about changing business models. But there are some local governments that are not waiting. Expect to see new open services networks emerging from local government and regional projects in the next year or two that will have viable business models. These new business models will help create enormous new community and economic development by offering businesses high performance networks with a wide variety of service offerings from many providers, not just one or two. These open service network projects have the right business model and will transform the local economies that make telecom essential public infrastructure. The electric utility that provides the power for the Oslo, Norway region (Norway's biggest city) has chosen an open services network architecture. The electric utility will build a single digital road system and let multiple service providers use it to deliver a wide variety of broadband services that will go far beyond the old Manufacturing Economy "triple play" model. A key advantage of the open services network approach is the financial stability of the business model. The old style triple play caps overall revenue, but the open services network has nearly unlimited revenue potential, with many providers paying use fees, rather than just three. Design Nine specializes in open services network design. Give us a call if your community would like to see what kind of economic development and revenue benefits an open services network could bring to your region. Compared to other major industrialized countries, the U.S. "enjoys" some of the world's slowest broadband. Even worse, when you factor in price, we pay more and get less than countries like Japan, South Korea, France, Canada, and Sweden. 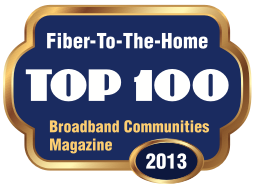 Over the past decade, the U.S. has gone from being the world leader in broadband to 16th in the world. Communities and regions waiting for the Federal government to solve this problem are going to fall farther and farther behind economically. To be fair, it is important to remember that places like South Korea and Japan are not much bigger than some regional trading areas in the U.S. (that is, 2-4 rural counties in size). Are we really going to settle for an economic development slogan of "Our region...broadband almost as good as some tiny countries from overseas?" The good news is that the technology and systems needed to take high performance fiber and wireless connections everywhere in a region (every single home and business that wants service) are mature, affordable, and available off the shelf. It is time to just roll up our sleeves and get the job done. This article notes that the number of cellphone calls has declined in the UK for the first time ever, suggesting that the "newbie" period for cellphones is over. Since 1993, I have been able to observe the "newbie" phenomenon firsthand as new systems and technology are embraced by the public, and in fact, it is a well known process that is often ignored, strangely enough, by many in the IT business, who want to believe in endless growth and by extension, endless profits. It never works that way, and the dot-com bubble was fueled by large numbers of new Internet users and a naive belief that there was a never ending supply of new users. Of course, there was not, and we all know how things turned out. Companies that had built vacuous business plans based on fantasy-based market growth collapsed. It is good news that cellphone use is starting to level off. Most people that need or want cellphones have them, they work in most places, and the number of cell towers will start to level off. The article notes that text messaging is still picking up as many find that a useful alternative to the phone--less obtrusive and more immediate than leaving a voicemail. It also means that the etiquette of using cellphones appropriately will start to solidify. With a decreasing number of new users who don't know the rules, we have a better chance of actually using cellphones more sensibly over time. Is India's "free broadband" a good idea? India has announced an ambitious plan to provide free wireless broadband throughout the country. It is not at all clear that "free broadband" is sustainable. The longstanding problems with free services (in any market, not just broadband) include market distortion and low quality service. Market distortion occurs because "free" services suggest to users of the service that supply is inexhaustible, and so users use as much as possible. Not everyone thinks this way, but a small number of users who hog bandwidth can consume all available supply. This leads to low quality of service, in part because there is no pricing feedback to users (see above), and in part because the lack of revenue makes it difficult to expand capacity as demand increases. like the service and use it a lot. From an economic perspective, charging a fixed fee no matter how much bandwidth a customers uses is exactly the same as giving the service away for free. Neither one provides the funds necessary to expand capacity, increase service areas, pay for proper maintenance and upkeep, and add new services. A solution is to move to a service oriented architecture (a different network architecture AND a different business model) that conveys a clearer relationship between supply and demand to customers. Customers pay for services, rather than buying a bucket of bandwidth. Service fees are based on the real cost of providing the service, thus providing information to customers about supply and demand. This can be done easily with both wired and wireless networks. If the Indian government is going to build a digital road system and let private companies use the road system to sell services in return for a share of revenue, the system could work very well. Providing a free 2 megabit connection but no services is very similar to the way roads are managed--governments build roads but allow businesses and customers to use those roads for entirely private business transactions. For the second year in a row, no American city made the list of the world's "Intelligent Cities," which is compiled by the Intelligent Community Forum. This highlights the longstanding regulatory and leadership problems we have in the U.S. when it comes to telecom. Some state and Federal regulators and legislators still think re-monopolizing the telecom industry (well under way with the re-forming of AT&T) is the answer to the country's long term economic development challenges. Other elected officials just keep hoping that the problem will go away, even though each passing year makes the businesses in their regions less and less competitive globally. Getting fiber to the premise (FTTP) is always a challenge. In many communities, there is not space available on aging telephone poles, or the incumbents try to charge exorbitant make-ready fees to hang a thin fiber cable. Trenching is an alternative, but that can be more expensive and disruptive. CableRunner now offers an interesting alternative, which is to use existing sewer and stormwater drain infrastructure to run fiber through neighborhoods and into homes. And there is one more thing. Vienna's project is an Open Service Provider Network (OSPN) that will offer the city's residents and businesses a wide choice of services with multiple providers in most service categories. It is just one more reminder of the global competition today: a city taking fiber to every home and business using an open access model. Vienna's goal is to be the best connected city in the world. What is your community's telecommunications goals? I think there are some interesting new job opportunities that are going to emerge in the next ten years, and one would hope K12 schools and colleges start now with new and revised curriculums to meet demand. The first hot job is going to language specialist. Linguists who can speak at least four languages and ideally six or more are going to be able to write their own ticket in the work world, and will be able to command high dollar salaries. As the world economy continues to heat up, more and more businesses are going to be able to grow only by expanding into international markets, where they will have to be able to speak languages other than English. If six languages sounds like a lot, it really is not. Once you get past three, it is pretty easy. Languages that are going to be important include Chinese, Japanese, and Russian, among others. The other hot job is going to be information manager. Traditionally, "information management" has been relegated to IT departments, where geeks build complicated databases and systems that usually require users to cram information into often convoluted and rigid formats, because that is the way IT people think. The new information manager will NOT be part of an IT department, but will work alongside business managers, salespeople, and project team members to keep information flowing between team members and clients. The information manager will have a high degree of skill using a wide variety of information tools, and will be able to craft custom solutions for individual projects using lots of off the shelf applications and judicious (and limited) use of scripts and small amounts of programming. This job will be the antithesis of the IT department approach to information management. How about your local schools? Are they looking ten to twenty years ahead and trying to identify where job demand is going to create opportunities and needs? If not, why not?